Waving goodbye to their new found friends in the Toy Shop window Bertie lead Croc towards the large, towering structure in front of them. Croc was too excited about his new friends to at first to look up, until Bertie gave him a little nudge and pointed towards the sky. Croc’s jaw fell open revealing a very impressive set of teeth. The building in front of him was like nothing he had ever seen before. Croc was looking at the impressive York Minister. Bertie instantly went into tour guide mode explaining, to a rather overwhelmed Croc, that the stone York Minister was badly damaged in a fire during an uprising in 1068 and the Normans built a new minster in around 1080. This was the basis of the present impressive Minister he was looking at today. It was indeed impressive, thought Croc. He felt slightly dizzy looking up at the tall spires on the Minister. The gargoyles looking back down at him and Bertie made Croc do a little shiver and he sank a little deeper into the pocket he was in. Soon he had forgotten the stony stares and had become immersed in the ornate detail everywhere he looked. As they walked around the side of the building, Croc also noticed the impressive towering windows. Where Croc was from this building would not have survived this long as a cyclone would have destroyed it by now he thought as he posed happily and proudly for a photograph in front of the entrance. Bertie smiled to himself noting Croc’s new found confidence in having his photograph taken. Bertie took Croc all the way around the outside of the Minister, allowing him to take in all the details of the huge building. He then pointed to a smaller building which was in front of them. Peeling his eyes away from the impressive shadow of the Minister Croc saw the most unusual building he had ever seen. It looked like an architectural zebra! Bertie laughed at Croc’s description and told Croc that it was a classic tutor building from around the 16th to 18th Century. As the walked along admiring the architecture, Bertie knew exactly where to take Croc next….. The only time Croc took his eyes away from the Minister! Very interesting and enjoyable post! 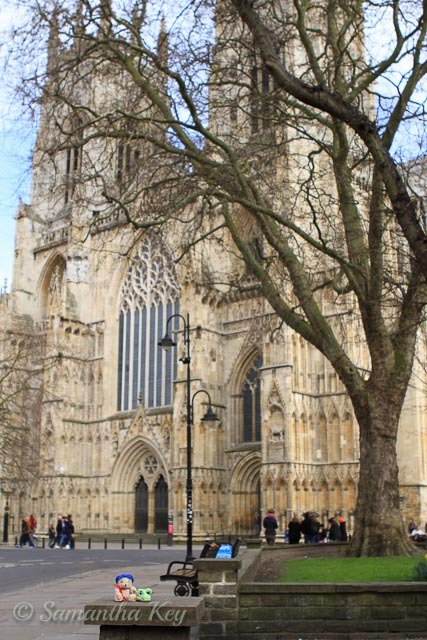 Loved the story and thoroughly enjoyed re-visiting the Minster with Bertie and Croc! Thank you! Thank you. There is so much history to photograph there! It’s a really interesting place.